Weeks 17 & 18: done! Weeks 14, 15 & 16: done! If I say ... , what do you tell me? I have marketing lesson. Then, I test English class but in addition to my other lessons because I can't take this course and have the exam. ESDES (my school in France) doesn't want because it is a year 4's lesson and I have already Spanish lesson. But I think I won't continue this course because it's very easy and I don't learn anything. During the afternoon, Marlène and I cook crepes because last week it was Candlemas. Hummmm, bon appétit! I have class, so I study. Nothing to report. I test Business management. I like it! Students are very nice and speak with us. Lecturer is nice and interresting. She speaks snowly and she asks us so many questions. We can participate during this class. We learn something because we haven't seen theses notions before. I have Business Management at 11 o'clock. Very good lesson but the lecturer comes at 11:38. We study about entreprenership and have an oral presentation. I am so stressed but finally, it is good. For the afternoon, I write articles on this blog, study and watch serie called Scandal. Besides, if you have never seen it, watch it, it's so gooooood! I am happy, I find a job! I have an interview with Sian and it's okay. I will work for WALK WITH ME. It's an association for people with an intellectual Disabilit. I will take care about two teenagers once or twice a week. The weather is bad, sometimes it's rainning so, I decide to visit Kilmainham prison. 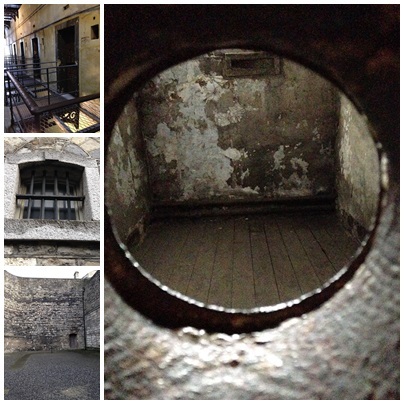 Even if major building works being undertaken at Kilmainham Gaol until the end of December 2015, the visit is great. The history of the Easter uprising is only 100 years ago, yet seems longer. Guide is very informational and telling the history some of which is shocking to hear. I go to the badminton training. I play a lot. It's fun and I can do sport! I come back at home, eat, have a shower and let's go to Jona (German guy) to a pre party and then to Dtwo to Erasmus party for Valentin's day. The pre party is nice but, music at Dtwo is horrible and we come back early with Marlène who sleeps with me. John and Veronica are drinking a beer and watch a movie so we speak with them and finally we go to bed. I play a lot with Corey, so cute. And then I go to Dublin City Center to watch the rugby match Ireland vs France in a bar called Living room. It's a very famous bar for sport events. 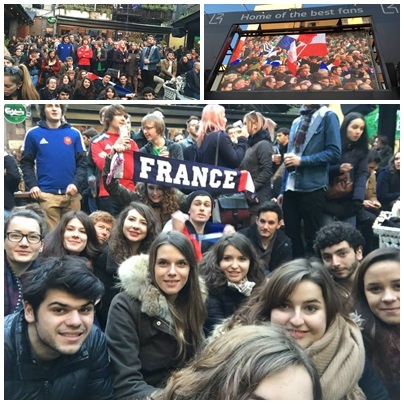 Very very very good atmosphere even if France looses. Result : Ireland 18 - 11 France. We go to Burger King (hum Delicious) and come back. It's Sunday, I stay at home, organize my trips, speak with the family, watch a movie and sleep.